What do you do if you're shopping for Production Basics industrial furniture and you can't find the exact product solution you need among the hundreds of items available at QSource.com? Customize, customize, customize! With the goal of helping you stay productive and work efficiently, Production Basics offers a custom products service. Need a specially sized workstation? Or perhaps accessories to perform a unique task? 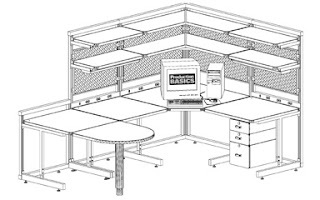 Production Basics can quickly help you meet those requirements with high-quality workstations and parts featuring special materials, finishes, and sizes & configurations to meet your specifications. 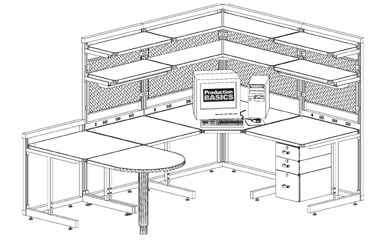 custom workstations from your specs. What works and what doesn't in your current set-up? What is the layout of your facility/department? What are your specific weight capacity, size, material, and function requirements? What is the size and weight of the material if material conveyance is needed? Do you need a mobile option? Do you require adjustable height? Q Source, working with Production Basics, wants to help you find solutions to meet your exact requirements. If you believe a custom workstation or part will help you to enhance productivity in your workplace, please contact us via phone (800-966-6020) or email and one of our helpful associates will guide you through the process. And, remember, QSource.com currently features more than 300 Production Basics workstations and accessories to meet your standard needs.